The loft, creating a realm filtering the outside world and providing a peaceful land to especially allow the client to listen and communicate with his innermost being. It’s a small but intimate space for both inner and outer part of life. The room serves as a space for the client to drink, to read, to listen music and to meditate. It is a LOFT space located on top of the apartment which simply used by the client only. The main challenge is to enrich and transform the original cubical and cold room into a protected and intimate space with one simple design move and the very low budget provided. To provide the softness and warmness the client needed. So we simply implant one pure and changing circular shell/skin into the existing cubical space, aiming to alter the original cognition of the inhabitant’s life in this space, and to provide an exclusive privacy for him to enabling him to free himself from the stress from real life and embrace his spiritual inner peace. And he can just insert his mind into the space with his furniture and temporarily get away from his hectic life. The space was applied with looped ribbon space elements to form a continual space extending outward to the balcony, along with the variety of heights and irregular arrangements of lighting to create the harmony and human atmosphere of the space. 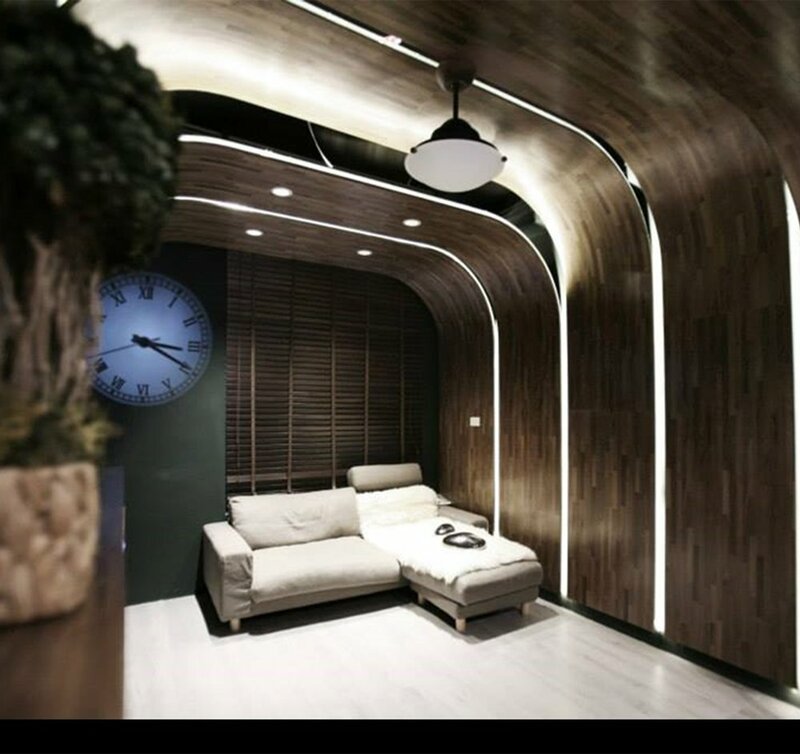 The ribbon skin interlocking with the lighting start to blend in all the elements in this room and to conceal and merge the functional equipment within it to create the simplicity and purity of the space. Applied dark wood finish is to create the both contrast and balance between brightness and darkness within the space. The texture of the wooden surface is composed by small scale wood patterns which can provide the detailed layer of space reading and perception and enhance the wrapping and flowing movements of the space. This space slows down your life and lead you to a safe and peaceful mental status. 這是一個專屬於業主使用的頂樓空間, 我們企圖在這個屋頂的空間創造另一場域，一個可以過濾掉外在世界的紛擾而提供使用者一個安寧的生活空間. 在這裡使用者可以專注地聆聽與感受自己內心的聲音, 一個可以自我對話的空間,小而親密, 由內而外. 提供業主一個品酒, 閱讀, 聆聽與冥想的空間. 在極低的預算與原有家具的限制下, 我們決定只用一個極為單純的設計動作, 就是純粹的只植入一個單一但重複多變的環狀皮層空間, 去將原先方正冷酷的空間轉化成一個業主所需要的柔軟而溫暖, 安全而私密的私人場域, 讓業主可以單純的放入他原有的家具就能使用. 並且可以在這空間中短暫的脫離他原先的生活模式與其中的繁忙焦慮. 提供他一種極致的隱私與安全感, 從世俗的煩惱中解放他, 讓他有機會與自己的內在對話並整理思緒, 進而達成一種心靈的平靜. 環狀的皮層設計，由內而外延伸, 由室內到陽台, 貫穿整個頂樓生活空間，不同高度的空間錯落與縫隙中的燈光編織出一個室內的新的皮層將原先冷酷的空間氛圍轉化成一個溫暖而私密, 律動而自由的環境。同時這環狀的空間元素除了能創造出空間中虛實的層次變化之外還能將所有空間中的機能性的設備都混和為一體，, 藉此創造出空間的單一性與純粹性。 使用在環形皮層上的深色木皮與搭配期間的燈光可同時創造出空間中的明與暗之間的對比感與平衡感, 提供空間中氛圍的細微變化. 而小尺度的拼貼的木紋肌理除了可以創造處細緻的空間層次感之外還可以強化出空間的圍塑與流動感.